The Los Angeles Film Critics Association has come out with its winners and in the Animation Award, Ratatouille" and "Persepolis" have tied for the win. I guess sharing is better than losing, eh? On another note, the Boston Society of Film Critics have given out their awards and Brad Bird has won for Best Screenplay with "Ratatouille". That's not bad, considering it beat out the Coen brothers' "No Country for Old Men", which took home Best Picture, but not screenplay. It appears that unlike the Academy, the BSFC consider animation to be of equal value when it comes to awards. How nice. This all adds to the awards roster that Remy and his friends have been receiving lately. Brad Bird's film got the National Board of Review Award for Best Animated Feature the other night and the awards season is just getting started. I have a feeling that the Director will have to make a lot of room on his trophy shelf early next year. My congratulations to Brad Bird, John Lasseter and the entire crew at Pixar. Honor, which of these do you think is going to win the Oscar? Persepolis just has "upset" written all over it. The academy seems to love these "indie-style" films. I haven't seen it yet so I can't judge, but Ratatouille was just a masterpiece. It would be a shame if it lost just because the academy thought the content in Persepolis was more mature (and hence better). It would be a shame if it lost just because the academy thought the content in Persepolis was more mature (and hence better). I haven't seen Persepolis but the buzz on it is ridiculously strong. At Cannes it was nominated for the Palme d'Or and was the winner of the Jury Prize. This is not some hackwork. Besides, I wouldn't be mad if it won. A traditionally animated, intelligent, foreign, film for adults winning best animated feature? It's like a dream come true. Oh, I wouldn't be mad either, I'd be glad for 2D animation making a comeback actually. I'm just saying that because all things being equal (both movies are masterpieces), it seems like this is a no-brainer decision by the academy because not once have they picked a rated G film over a higher-rated movie with socio-political themes. If Ratatouille wins this, it should be considered an upset. I suppose the shame is that one of these movies have to lose, and the one that does will be lumped in with the likes of "Surf's Up" or "Bee Movie" as a "mere" 2007 Best Animated Feature nominee. 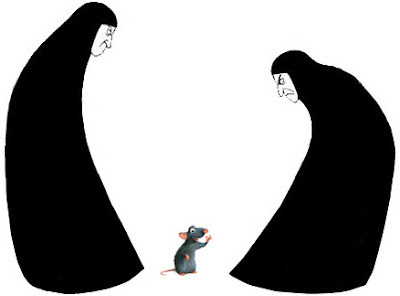 IMO Persepolis was way way better than ratatouille. I hope it wins the oscar.